We spend hundreds of pounds on grocery every month. Do you ever feel you’re walking away with fewer products or end up paying more than your last grocery trip? This is because major supermarkets like Tesco, Sainsbury’s and Morrison’s continue to raise prices in store. However, now with price comparison sites like mysupermarket.co.uk, shoppers have started to spend more time planning their shopping based on whichever supermarket is offering the best price for their basket of goods. Supermarkets enter a pricing war every day – trying to gain new customers by communicating messages like ‘We’re cheaper’ or ‘Our loyalty program is more rewarding’. In reality, when the dust settles the cost of shopping averages out to be pretty much the same over the year. Furthermore, supermarkets often face price increases themselves from suppliers. Big brands we’re all so loyal to; Coke-a-Cola, Heinz, and Persil for example force retailers to either squeeze down their own profits or increase the price in store – leaving the customer to pay higher prices. Everything from our basic essentials like bread and milk, right across to luxuries – your favorite bottle of wine or beer, chocolates for the kids, even deodorant, every year we pay more. The rise of discounter stores has received much praise in recent years. German giants – Lidl and Aldi are gaining new customers and growing faster than competitors, their success is down to offering a unique own label range which is as good as the quality we're used to experiencing from well-known national big brands. 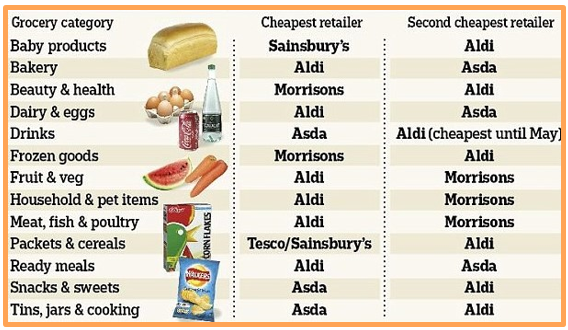 The table below shows what's generally cheaper and by which supermarket. Regardless of the changes, we notice in shopping behavior, we all need to be wiser on how much we pay for goods. What if there's a way to never pay from your own pocket for groceries? What if there’s a way you could learn how to earn your grocery free - for life? Want your groceries covered? Join Profit Squirrel. Proven to help you earn £500 extra every month - tax-free, Profit Squirrel shows everyone how to earn a simple second income. Once you learn how to make money with Profit Squirrel you will be able to get involved with multiple opportunities to take home enough money to stock up your cupboards with all the grocery you need. Might you like to indulge in new types of food or try new restaurant perhaps? 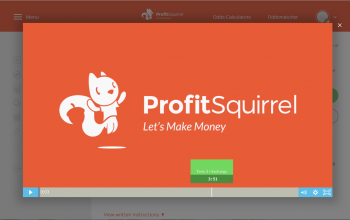 Profit Squirrel will enable you to make money so you can enjoy the finer things in life and start living more comfortably. Thousands are using this method already, a method that’s been nationally recognized by The Guardian and The Times. Members are using this method to pay for more than just grocery shopping. 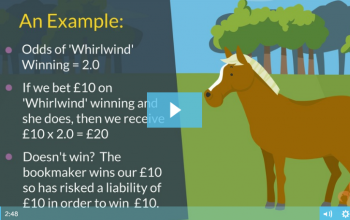 What would you do with an extra £500 every month? Profit Squirrel is free to join. Start making money today. I was very frustrated with my local Tescos and decided to take on the Aldi price challenge. Surprisingly saved £17 off my weekly shop! The quality is great. Which Game's Improved the Most? 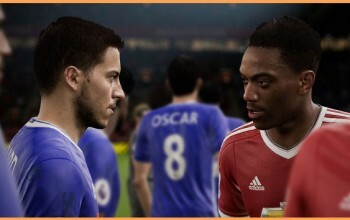 FIFA 17 or PES 2017 Get £30 off.